Alexander Vasilyevich Kolchak KB (Russian: Алекса́ндр Васи́льевич Колча́к; 16 November [O.S. 4 November] 1874 – 7 February 1920) was an Imperial Russian admiral, military leader and polar explorer who served in the Imperial Russian Navy, who fought in the Russo-Japanese War and the First World War. During the Russian Civil War, he established an anti-communist government in Siberia—later the Provisional All-Russian Government—and was recognised as the "Supreme Leader and Commander-in-Chief of All Russian Land and Sea Forces" by the other leaders of the White movement from 1918 to 1920. His government was based in Omsk, in southwestern Siberia. For nearly two years, Kolchak was Russia's internationally recognized head of state. However, his effort to unite the White Movement failed; Kolchak refused to consider autonomy for ethnic minorities and refused to cooperate with non-Bolshevik leftists, heavily relying on outside aid. This served only to boost the Reds morale, as it allowed them to label Kolchak as a "Western Puppet". As his White forces fell apart, he was betrayed and captured by the Czechoslovak Legion who handed him over to local Socialists-Revolutionaries, and he was soon after executed by the Bolsheviks. Kolchak was born in Saint Petersburg in 1874 to a family of minor Russian nobility of Moldovan origin. Both his parents were from Odessa. His father was a retired major-general of the Marine Artillery and a veteran of the 1854 siege of Sevastopol, who after retirement worked as an engineer in ordnance works near St. Petersburg. Kolchak was educated for a naval career, graduating from the Naval Cadet Corps in 1894 and joining the 7th Naval Battalion. He was soon transferred to the Russian Far East, serving in Vladivostok from 1895 to 1899. He then returned to western Russia and was based at Kronstadt, joining the Russian Polar expedition of Eduard Toll on the ship Zarya in 1900 as a hydrologist. After considerable hardship, Kolchak returned in December 1902; Eduard Toll with three other explorers continued further north and were lost. 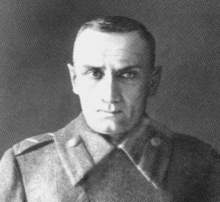 Kolchak took part in two Arctic expeditions to look for the lost explorers (who weren't found) and for a while was nicknamed "Kolchak-Poliarnyi" ("Kolchak the Polar"). For his explorations Kolchak received the highest award of the Russian Geographical Society. In December 1903, Kolchak was en route to St. Petersburg with plans to marry his fiancée Sophia Omirova when, not far from Irkutsk, he received notice of the start of war with the Empire of Japan and hastily summoned his bride and her father to Siberia by telegram for a wedding, before heading directly to Port Arthur. In the early stages of the Russo-Japanese War, he served as watch officer on the cruiser Askold, and later commanded the destroyer Serdityi. He made several night sorties to lay naval mines, one of which succeeded in sinking the Japanese cruiser Takasago. He was decorated with the Order of St. Anna 4th class for the exploit. As the blockade of the port tightened and the Siege of Port Arthur intensified, he was given command of a coastal artillery battery. He was wounded in the final battle for Port Arthur and taken as a prisoner of war to Nagasaki, where he spent four months. His poor health (rheumatism, a consequence of his polar expeditions) led to his repatriation before the end of the war. Kolchak was awarded the Golden Sword of St. George with the inscription "For Bravery" on his return to Russia. Returning to Saint Petersburg in April 1905, Kolchak was promoted to lieutenant commander and took part in the rebuilding of the Imperial Russian Navy, which had been almost completely destroyed during the war. He served on the Naval General Staff from 1906, helping draft a shipbuilding program, a training program, and developing a new protection plan for St. Petersburg and the Gulf of Finland. Kolchak took part in designing the special icebreakers Taimyr and Vaigach, launched in 1909 spring 1910. Based in Vladivostok, these vessels were sent on cartographic expedition to the Bering Strait and Cape Dezhnev. Kolchak commanded the Vaigach during this expedition and later worked at the Academy of Sciences with the materials collected by him during expeditions. His study, The Ices of the Kara and Siberian Seas, was printed in the Proceedings of the Russian Imperial Academy of Sciences and is considered the most important work on this subject. Extracts from it were published under the title "The Arctic Pack and the Polynya" in the volume issued in 1929 by the American Geographical Society, Problems of Polar Research. In 1910 he returned to the Naval General Staff, and in 1912 he was assigned to the Russian Baltic Fleet. The onset of the First World War found him on the flagship Pogranichnik, where Kolchak oversaw the laying of extensive coastal defensive minefields and commanded the naval forces in the Gulf of Riga. Commanding Admiral Essen was not satisfied to remain on the defensive and ordered Kolchak to prepare a scheme for attacking the approaches of the German naval bases. During the autumn and winter of 1914–1915, Russian destroyers and cruisers started a series of dangerous night operations, laying mines at the approaches to Kiel and Danzig. Kolchak, feeling that the man responsible for planning operations should also take part in their execution, was always on board those ships which carried out the operations and at times took direct command of the destroyer flotillas. He was promoted to vice-admiral in August 1916, the youngest man at that rank, and was made commander of the Black Sea Fleet, replacing Admiral Eberhart. Kolchak's primary mission was to support General Yudenich in his operations against the Ottoman Empire. He also was tasked with countering the U-boat threat and to plan the invasion of the Bosphorus (never carried out). Kolchak's fleet was successful at sinking Turkish colliers. Because there was no railroad linking the coal mines of eastern Turkey with Constantinople, the Russian fleet's attacks on these Turkish coal ships caused the Ottoman government much hardship. In 1916, in a model combined Army-Navy assault, the Russian Black Sea fleet aided the Russian army's capture of the Ottoman city of Trebizond (modern Trabzon). One notable disaster took place under Kolchak's watch: the dreadnought Imperatritsa Mariya exploded in port at Sevastopol on 7 October 1916. A careful investigation failed to determine whether the cause of the disaster was accident or sabotage. The Black Sea fleet descended into political chaos after the onset of the 1917 February Revolution. Kolchak was relieved of command of the fleet in June and traveled to Petrograd (St. Petersburg). On his arrival at Petrograd, Kolchak was invited to a meeting of the Provisional Government. There he presented his view on the condition of the Russian armed forces and their complete demoralisation. He stated that the only way to save the country was to re-establish strict discipline and restore capital punishment in the army and navy. During this time many organisations and newspapers of a conservative inclination spoke of him as a future dictator. A number of new and secret organisations had sprung up in Petrograd with the goal of suppressing the Bolshevist movement and the removal of the extremist members of the government. Some of these organisations asked Kolchak to accept the leadership. When news of these plots found their way to then Naval Minister of the Provisional Government, Alexander Kerensky, he ordered Kolchak to leave immediately for America. Admiral James H. Glennon, a member of American mission headed by Senator Elihu Root, invited Kolchak to the United States to brief the American Navy on the strategic situation in the Bosphorus. On 19 August 1917 Kolchak with several officers left Petrograd for Britain and the United States as a quasi-official military observer. When passing through London he was greeted cordially by the First Sea Lord, Admiral Sir John Jellicoe, who offered him transport on board a British cruiser on his way to Halifax in Canada. The journey to America proved unnecessary, as by the time Kolchak arrived, the US had given up the idea of any independent action in the Dardanelles. Kolchak visited the American Fleet and its ports, and decided to return to Russia via Japan. The Bolshevik revolution found Kolchak in Japan and then Harbin in November 1917. As a supporter of the Provisional Government, he returned to Russia, through Vladivostok, in 1918. Kolchak was an absolute supporter of the Allied cause against Imperial Germany and regarded Russia's immediate withdrawal from the conflict as dishonorable. Upon hearing of the October Revolution, Kolchak offered to enlist in the British Army to continue the struggle. The British were inclined to accept Kolchak's offer, and there were indeed plans to send Kolchak to Mesopotamia (modern Iraq). Ultimately, the British Foreign Office decided that Kolchak could do more for the Allied cause by toppling Vladimir Lenin and the Bolsheviks and bringing Russia back into the war on the side of the Allies. Reluctantly, Kolchak accepted the British suggestions and with a heavy sense of foreboding returned to Russia. Kolchak arrived in Manchuria and was placed in charge of security for the Russian-owned Chinese Eastern Railroad. Arriving in Omsk, Siberia, en route to enlisting with the Volunteer Army, he agreed to become a minister in the (White) Siberian Regional Government. Joining a 14-man cabinet, he was a prestige figure; the government hoped to play on the respect he had with the Allies, especially the head of the British military mission, General Alfred Knox. Knox wrote that Kolchak had "more grit, pluck and honest patriotism than any Russian in Siberia". The character and soul of the Admiral are so transparent that one needs no more than one week of contact to know all there is to know about him. He is a big, sick child, a pure idealist, a convinced slave of duty and service to an idea and to Russia. An indubitable neurotic who quickly flares up, exceedingly impetuous and uncontrolled in expressions of displeasure and anger; in this respect he has assimilated the highly unattractive traditions of the naval service, which permit in high naval ranks behavior that in our army has long since passed into the realm of legend. He is utterly absorbed by the idea of serving Russia, of saving her from Red oppression, and restoring her to full power and to the inviolability of her territory. For the sake of this he can be persuaded and moved to do anything whatever. He has no personal interests, no amour propre: in this respect he is crystal pure. He passionately despises all lawlessness and arbitrariness, but because he is so uncontrolled and impulsive, he himself often unintentionally transgresses against the law, and this mainly when seeking to uphold the same law, and always under the influence of some outsider. He does not know life in its severe, practical reality, and lives in a world of mirages and borrowed ideas. He has no plans, no system, no will: in this respect he is soft wax from which advisers and intimates can fashion whatever they want, exploiting the fact that it is enough to disguise something as necessary for the welfare of Russia and the good of the cause to be certain of his approval. Politically naive and an inept administrator, Kolchak described himself as a "military technician" who knew nothing of politics, described power as a "cross", and in a letter to his wife wrote about the "terrifying burden of Supreme Power" and admitted that as "a fighting man he was reluctant to face the problems of statecraft". The American historian Richard Pipes wrote that Kolchak's only strengths were his courage, patriotism, integrity, and a strong sense of honor, writing that he was "... in many ways, along with Wrangel, the most honorable White commander in the Civil War", but his weaknesses such his tendency to suffer from manic-depression and an inability to "understand people or communicate with them", which made him into "an execrable administrator in whose name were committed unpardonable acts of corruption and brutality that he personally found utterly repugnant." In November 1918, the unpopular regional government was overthrown in a British sponsored coup d'etat. Kolchak had returned to Omsk on 16 November from an inspection tour. He was approached and refused to take power. The Socialist-Revolutionary (SR) directory leader and members were arrested on 18 November by a troop of Cossacks under ataman Krasilnikov. The remaining cabinet members met and voted for Kolchak to become the head of government with emergency powers. He was named Supreme Ruler (Verkhovnyi Pravitel), and he promoted himself to full admiral. The arrested SR politicians were expelled from Siberia and ended up in Europe. The Provisional All-Russian Government has come to an end. The Council of Ministers, having all the power in its hands, has invested me, Admiral Alexander Kolchak, with this power. I have accepted this responsibility in the exceptionally difficult circumstances of civil war and complete disorganisation of the country, and I now make it known that I shall follow neither the reactionary path nor the deadly path of party strife. My chief aims are the organisation of a fighting force, the overthrow of Bolshevism, and the establishment of law and order, so that the Russian people may be able to choose a form of government in accordance with its desire and to realise the high ideas of liberty and freedom. I call upon you, citizens, to unite and to sacrifice your all, if necessary, in the struggle with Bolshevism. The Left SR leaders in Russia denounced Kolchak and called for his assassination. Their activities resulted in a small revolt in Omsk on 22 December 1918, which was quickly put down by Cossacks and the Czechoslovak Legion, who summarily executed almost 500 rebels. Subsequently, the SRs opened negotiations with the Bolsheviks and in January 1919 the SR People's Army joined up with the Red Army. Kolchak pursued a policy of persecuting revolutionaries as well as Socialists of several factions. 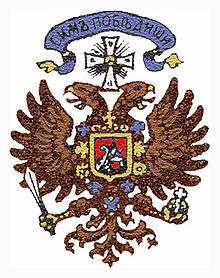 His government issued a decree on 3 December 1918 stating, "In order to preserve the system and rule of the Supreme Ruler, articles of the criminal code of Imperial Russia were revised, Articles 99 and 100 of which established capital punishment for assassination attempts on the Supreme Ruler and for attempting to overthrow his government. "Insults written, printed, and oral, are punishable by imprisonment under Article 103. Bureaucratic sabotage under Article 329 was punishable by hard labour from 15 to 20 years. Although the news of Kolchak's ascension to power spread very slowly behind Bolshevik lines, it caused considerable excitement among anti-communist Russians living there. Ivan Bunin wrote in his diary, "4/17 June 1919. The Entente has named Kolchak the Supreme Ruler of Russia. Izvestia wrote an obscene article saying: 'Tell us, you reptile, how much did they pay you for that?' The devil with them. I crossed myself with tears of joy." On 11 April 1919, the Kolchak government adopted Regulation no. 428, "About the dangers of public order due to ties with the Bolshevik Revolt". The legislation was published in the Omsk newspaper Omsk Gazette (no. 188 of 19 July 1919). It provided a term of 5 years of prison for "individuals considered a threat to the public order because of their ties in any way with the Bolshevik revolt." In the case of unauthorised return from exile, there could be hard labour from 4 to 8 years. Articles 99–101 allowed the death penalty, forced labour and imprisonment, repression by military courts, and imposed no investigation commissions. Kolchak acknowledged all of Russia's debts, returned nationalized factories and plants to their owners, granted concessions to foreign investors, dispersed trade unions, persecuted Marxists, and disbanded the soviets. Kolchak's agrarian policy was directed toward restoring private land ownership. To this end former Tsarist laws concerning property were restored. Promise to convene the Constituent Assembly the Bolsheviks had disbanded in January 1918. Allow local self-government in territories under his control. Promise not to restore the aristocracy, the "former land system" and "make no attempt to reintroduce the regime which the revolution had destroyed" (i.e. not restore the monarchy). Recognize the independence of Finland and Poland. Accept Allied mediation for relations with the Baltic states and in the Caucasus. Promise to join the League of Nations. Promise to pay all of Russia's debts. Pipes wrote though the Allies wanted a Constituent Assembly to decide the future of Russia, but they had decided in advance in their conditions that they had imposed such as no restoration of the monarchy many matters that properly should have been decided by the Constituent Assembly. As Kolchak was entirely dependent upon supplies from Britain as the British shipped him in the period October 1918-October 1919 about 600, 000 rifles, 6, 831 machine guns, and about 200, 000 uniforms, he had to accept nearly all of the conditions. In a telegram to Paris sent on 4 June 1919, Kolchak accepted every condition except for the independence of Finland, which he accepted only de facto, not de jure, saying he wanted the Constituent Assembly to grant Finland its independence. As the Allies were especially opposed to a return of the House of Romanov, Kolchak emphatically declared "that there cannot be a return to the regime which existed in Russia before February 1917". The British War Secretary Winston Churchill pressed very strongly in the cabinet for British recognition of Kolchak's government, but the Prime Minister David Lloyd George would only do so if the United States likewise recognized Kolchak. The American president Woodrow Wilson was strongly hostile towards Kolchak, openly doubted his word, and was against diplomatic recognition. Wilson's main adviser on Russia was the former head of the Provisional Government, Alexander Kerensky, who told Wilson that Kolchak was a "reactionary" who would "inaugurate a regime hardly less sanguinary and repressive than that of the Bolsheviks". Though American forces in Siberia co-operated with Kolchak, it was clear he was not the man favored by the United States as the next leader of Russia. American forces had been sent to Siberia less to help the Whites than to prevent the Japanese who had occupied the Russian Far East from annexing it as Tokyo was openly considering. The Great Soviet Encyclopedia alleges (without evidence) that more than 25,000 people were shot or tortured to death in Yekaterinburg alone. In March 1919 Kolchak himself demanded one of his generals to "follow the example of the Japanese who, in the Amur region, had exterminated the local population." Sovietskaya Rossiya, an official organ of the Soviet Bureau established by Ludwig Martens, quoted a Menshevik organ, Vsegda Vperyod, alleging that Kolchak's men used mass floggings and razed entire villages to the ground with artillery fire. 4,000 peasants allegedly became victims of field courts and punitive expeditions and that all dwellings of rebels were burned down. Those villages whose population meets troops with arms, burn down the villages and shoot the adult males without exception. If hostages are taken in cases of resistance to government troops, shoot the hostages without mercy. There was prominent underground resistance in the regions controlled by Kolchak's government. These partisans were especially strong in the provinces of Altai and Yeniseysk. In summer 1919 partisans of the Altai Region united to form the Western Siberian Peasants' Red Army (25,000 men). The Taseev Soviet Partisan Republic was founded south-east of Yeniseysk in early 1919. By the fall of 1919, Kolchak's rear was completely disintegrating. About 100,000 Siberian partisans seized vast regions from Kolchak's regime even before the approach of the Red Army. In February 1920, some 20,000 partisans took control of the Amur region. It is no longer possible for any sane man to regard the campaigns of Kolchak, Yudenich, Denikin and Wrangel otherwise than as tragic blunders of colossal dimensions. They (Kolchak, Kornilov, Denikin and Wrangel) were first of all patriots with a deep love for their country and worked for its salvation without any regard for self-advancement. Political intrigues were unknown to them and they were ready to work with men of any political party, so long as they knew that these men were sincere in their endeavours to free Russia... and to make it possible, after the end of the war, for a National Assembly, chosen by the people, to decide the character of the future Government of Russia. Initially the White forces under his command had some success. Kolchak was unfamiliar with combat on land and gave the majority of the strategic planning to D. A. Lebedev, Paul J. Bubnar, and his staff. The northern army under the Russian Anatoly Pepelyayev and the Czech Rudolf Gajda seized Perm in late December 1918 and after a pause other forces spread out from this strategic base. The plan was for three main advances – Gajda to take Archangel, Khanzhin to capture Ufa and the Cossacks under Alexander Dutov to capture Samara and Saratov. The White forces took Ufa in March 1919 and pushed on from there to take Kazan and approach Samara on the Volga River. Anti-Communist risings in Simbirsk, Kazan, Viatka, and Samara assisted their endeavours. The newly formed Red Army proved unwilling to fight and instead retreated, allowing the Whites to advance to a line stretching from Glazov through Orenburg to Uralsk. Kolchak's territories covered over 300,000 km² and held around 7 million people. In April, the alarmed Bolshevik Central Executive Committee made defeating Kolchak its top priority. But as the spring thaw arrived Kolchak's position degenerated – his armies had outrun their supply lines, they were exhausted, and the Red Army poured newly raised troops into the area. Kolchak had also aroused the dislike of potential allies, including the Czechoslovak Legion and the Polish 5th Rifle Division. They withdrew from the conflict in October 1918 but remained a presence; their foreign adviser Maurice Janin regarded Kolchak as an instrument of the British and himself was pro-SR. Kolchak could not count on Japanese aid either; the Japanese feared he would interfere with their occupation of Far Eastern Russia and refused him assistance, creating a buffer state to the east of Lake Baikal under Cossack control. The 7,000 or so American troops in Siberia were strictly neutral regarding "internal Russian affairs" and served only to maintain the operation of the Trans-Siberian railroad in the Far East. The American commander, General William S. Graves, personally disliked the Kolchak government, which he saw as monarchist and autocratic, a view that was shared by the American President, Woodrow Wilson. 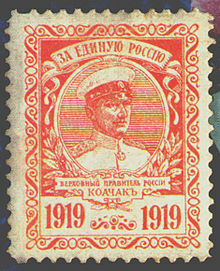 Postage stamp issued in 1919 with the inscription "For United Russia – Supreme leader of Russia, Kolchak." When the Red forces managed to reorganise and turn the attack against Kolchak, from 1919 he quickly lost ground. The Red counter-attack began in late April at the centre of the White line, aiming for Ufa. The fighting was fierce as, unlike earlier, both sides fought hard. Ufa was taken by the Red Army on 9 June and later that month the Red forces under Tukhachevsky broke through the Urals. Freed from the geographical constraints of the mountains, the Reds made rapid progress, capturing Chelyabinsk on 25 July and forcing the White forces to the north and south to fall back to avoid being isolated. The White forces re-established a line along the Tobol and the Ishim rivers to temporarily halt the Reds. They held that line until October, but the constant loss of men killed or wounded was beyond the White rate of replacement. Reinforced, the Reds broke through on the Tobol in mid-October and by November the White forces were falling back towards Omsk in a disorganised mass. At this point the Reds became sufficiently confident to start redeploying some of their forces southwards to face Anton Denikin. Kolchak also came under threat from other quarters: local opponents began to agitate and international support began to wane, with even the British turning more towards Denikin. 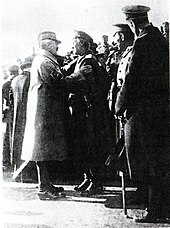 Gajda, dismissed from command of the northern army, staged an abortive coup in mid-November. Omsk was evacuated on 14 November, and the Red Army took the city without any serious resistance, capturing large amounts of ammunition, almost 50,000 soldiers, and ten generals. As there was a continued flood of refugees eastwards, typhus too became a serious problem. Kolchak had left Omsk on the 13th for Irkutsk along the Trans-Siberian Railroad. Travelling a section of track controlled by the Czechoslovaks, he was sidetracked and stopped; by December his train had only reached Nizhneudinsk. In late December Irkutsk fell under the control of a leftist group (including SRs and Mensheviks) and formed the Political Centre. One of their first actions was to dismiss Kolchak. When he heard of this on 4 January 1920, he announced his resignation, giving his office to Denikin and passing control of his remaining forces around Irkutsk to the ataman, G. M. Semyonov. The transfer of power to Semyonov proved a particularly ill-considered move. Kolchak was then promised safe passage by the Czechoslovaks to the British military mission in Irkutsk. Instead, he was handed over to the Left SR authorities in Irkutsk on 14 January. On 20 January the government in Irkutsk surrendered power to a Bolshevik military committee. The White Army under the command of General Vladimir Kappel advanced toward Irkutsk while Kolchak was interrogated by a commission of five men representing the Revolutionary Committee (REVKOM) during nine days between 21 January and 6 February. Despite the arrival of a contrary order from Moscow, Admiral Kolchak was sentenced to death along with his Prime Minister, Viktor Pepelyayev. Both prisoners were brought before a firing squad in the early morning of 7 February 1920. According to eyewitnesses, Kolchak was entirely calm and unafraid, "like an Englishman." The Admiral asked the commander of the firing squad, "Would you be so good as to get a message sent to my wife in Paris to say that I bless my son?" The commander responded, "I'll see what can be done, if I don't forget about it." A priest of the Russian Orthodox Church then gave the last rites to both men. The squad fired and both men fell. The bodies were kicked and prodded down an escarpment and dumped under the ice of the frozen Angara River. When the White Army learned about the executions, its remaining leadership decided to withdraw farther east. The Great Siberian Ice March followed. The Red Army did not enter Irkutsk until 7 March, and only then was the news of Kolchak's death officially released. Admiral Kolchak's government was not successful from the time of his taking the position of "Supreme Ruler" until his death. As a military commander he was unable to make successful strategic plans or to coordinate with other White Army generals such as Yudenich or Denikin. Kolchak also failed to convince potentially friendly Finland to join with him against the Bolsheviks. He was unable to win diplomatic recognition from any nation in the world, even Great Britain (though the British did support him to some degree). In addition he alienated the Czechoslovak Legion, which for a time was a powerful organised military force in the region and very strongly anti-Bolshevik. As was mentioned above, the American commander, General Graves, disliked Kolchak and refused to lend him any military aid at all. After decades of being vilified by the Soviet government, Kolchak is now a controversial historic figure in post-Soviet Russia. The "For Faith and Fatherland" movement has attempted to rehabilitate his reputation. However, two rehabilitation requests have been denied, by a regional military court in 1999 and by the Supreme Court of the Russian Federation in 2001. In 2004, the Constitutional Court of Russia returned the Kolchak case to the military court for another hearing. Monuments dedicated to Kolchak were built in Saint Petersburg in 2002 and in Irkutsk in 2004, despite objections from some former Communist and left-wing politicians, as well as former Soviet army veterans. His memorial in St. Petersburg is a frequent target of vandalism. There is also a Kolchak Island. The modern Russian Navy considered naming the third ship of the new Admiral Grigorovich-class frigates, Admiral Kolchak to commemorate the Admiral but declined to do so in the end. Kolchak was a prominent expert on naval mines and a member of the Russian Geographical Society. Among his awards are the Saint George Gold Sword for Bravery, given for his actions in the battle of Port Arthur and the Great Gold Constantine Medal from the Russian Geographic Society. It's about a man who tries to create history, to take an active part in history, as he gets caught in the turmoil. However, he keeps on struggling, he preserves his honor and his dignity, and he continues to love. A collectible silver coin (31.1 gr, dia 40mm) showing Admiral Kolchak has been struck. In the Hearts of Iron 4 grand strategy game's 'Kaiserriech' mod, where an alternate History where Germany won the First World War is shown, Kolchak is presented as the leader of Transamur - a Japanese puppet state in the modern day Primorsky Krai area of Russia - with goals to take over from Kerensky's, or subsequent other, Government which rules Russia. ^ White, Matthew (2012). The Great Big Book of Horrible Things. W. W. Norton. p. 363. ISBN 9780393081923. ^ Kolchak A.V., 1909, Ice of the Kara and Siberian Seas (170 pp.). St. Petersburg (in Russian). ^ a b c d e f g Pipes 1993, p. 48. ^ a b c Pipes 1993, p. 49. ^ a b Pipes 1993, p. 49-50. ^ Pipes 1993, p. 50. ^ a b c Цветков В. Ж. Белый террор – преступление или наказание? Эволюция судебно-правовых норм ответственности за государственные преступления в законодательстве белых правительств в 1917–1922 гг. ^ Ivan Bunin (1926) Cursed Days: A Diary of Revolution, p. 177. ^ a b c d Pipes 1993, p. 78. ^ a b c d e f g h i Pipes 1993, p. 79. ^ Pipes 1993, p. 79-80. ^ Pipes 1993, p. 80. ^ Arno J. Mayer (2000). The Furies: Violence and Terror in the French and Russian Revolutions. Princeton University Press. pp. 254–. ISBN 978-0-691-09015-3. – not an original source citation, Mayer's footnote for this statement not cited. ^ M. I. Smirnov (1933). "Admiral Kolchak". The Slavonic and East European Review. 11 (32): 373–387. JSTOR 4202781. ^ a b Peter Fleming (1963) The Fate of Admiral Kolchak, Harcourt, Brace, & World, Inc., pp. 216–217. ^ "Graves To Lead Our Siberian Army. Former Assistant Chief Of General Staff To Have 7,000 Men At The Start. Troops From Philippines 27th and 31st Regiments". New York Times. August 8, 1918. ^ "В Петербурге доску Колчаку вновь закрасили черной краской". Lenta. 10 February 2017. Retrieved 12 February 2017. ^ a b c Колчак Александр Васильевич (in Russian). Hrono.ru. Retrieved 3 January 2009. ^ Плотников, И.Ф. Александр Васильевич Колчак. Жизнь и деятельность (in Russian). Militera.lib.ru. Retrieved 3 January 2009. Pipes, Richard Russia Under the Bolshevik Regime, New York: Alfred Knopf, 1993. Smele, Jonathan Civil War in Siberia: The Anti-Bolshevik Government of Admiral Kolchak, Jonathan D. Cambridge University press, 1996. White Siberia, N.G.O. Pereira. McGill-Queens University Press, 1996. Connaughton, R. M. The Republic of the Ushakovka: Admiral Kolchak and the Allied Intervention in Siberia, 1918–1920, Routledge, 1990. Cracknell, Brian. The Failure of Admiral Kolchak, Eureditions, 1978. Hammond, Gail C. Admiral Kolchak: A Contrast of Hope and Betrayal for Russia, 1918–1920, Western Connecticut State College, 1982. Landfield, Jerome. "The Attempt to Discredit Kolchak," Weekly Review, Vol. I, No. 9, July 1919. Stewart, George. The White Armies of Russia; A Chronicle of Counter-Revolution and Allied Intervention, The Macmillan Company, 1933. Unterberger, Betty Miller. America's Siberian Expedition, 1918–1920; A Study of National Policy, Duke University Press, 1956. Wikimedia Commons has media related to Alexander Kolchak.